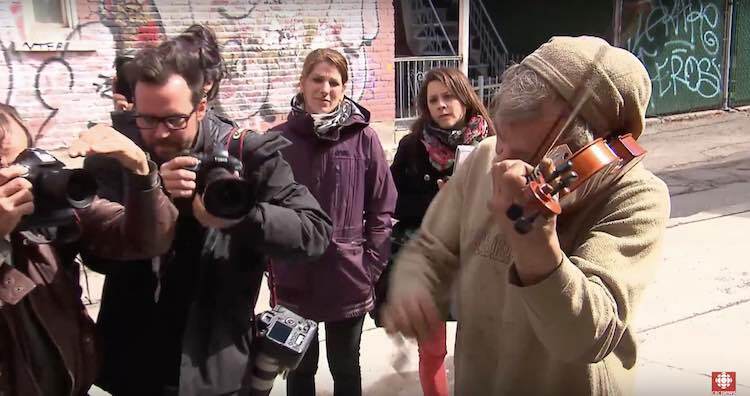 When a thief stole a homeless man’s violin in Canada, a symphony of sympathy led to an orchestra replacing the beloved instrument. Mark Landry woke up Tuesday morning to realize his violin was missing. The homeless man used it to play for tips outside the Montreal Metro, but without it, he was forced to sit silently, holding a sign in French announcing the theft and asking for donations to replace it. Photos of the sign began popping up on social media, and when the staff at Montreal’s Orchestre Métropolitain saw them, they didn’t fiddle around. “We said, ‘Oh my God, this poor man lost his only way of communicating his passion to others,’” orchestra CEO Jean Dupré told the Washington Post. He put in a call to local violin shop Maison du Violon. The story tugged the heartstrings of the store owners and they sold Dupré a new violin and bow at cost, without making any profit. By that afternoon, reporters and onlookers gathered around Landry as Dupré delivered the new violin — and the homeless man performed for his audience to a standing ovation.